Cursed with a corrupted first dream she was scarred for life, lived as a pariah, yet gifted with great power and talent. 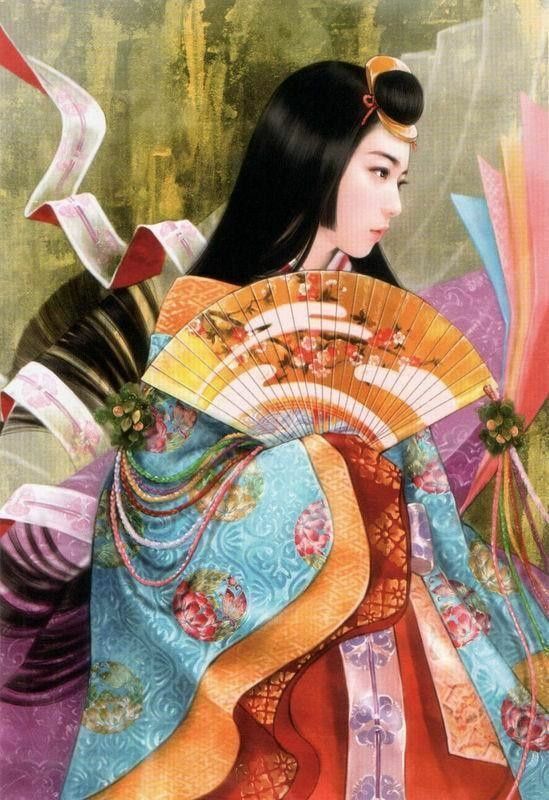 While masking her form she appears as a young woman dressed in ornate robes, in the style of a junihitoe with colorful designs of red, gold, and blue, and tied at the waist in a brilliant purple. Her face is covered in a fox mask. Her hair is long and silvery blue, ending in white tips. In true form, however, she is a massive, 16ft monster with many bushy tails, ending in tips covered in a colorful paint-like substance. Her hands sport long fingers, ending in sharp nails. Fur is flowing, pale silvery in color, nearly white, with highlights of light blue tipping her ears and running down her back, darkening to black on her hands and feet, somewhat resembling gloves that run down her arms. Her head is decorated, blue markings run across her lips and markings stripe outwards from her eyes down onto her cheeks. Her eyes are yellow, with + shaped pupils that extend more vertically. Her fearsome maw sports long fangs and sharp teeth, often bearing. Magic/Abilities: With the ability to paint just about anything she can imagine into existence, she is naturally one of the most dangerous of the Harlequins, the only limitations is that they can't be animated objects and must be solid, and an object that weapons she may create are not as strong as one made of the original materials. Of this, she can repaint scenery and effectively control her surroundings, as well as travel through splotches of paint she creates. Along with this is her large powerful form, offset by being surprisingly light for her size, being quite agile and fast. This serves both as a strength and a weakness. She also possesses the ability to temporarily change the appearance of herself and others using "masking," a rare skill only a few have mastered. Born near the densely forested edge of Lunalake, to an architect and a carpenter couple who's combined talents were among those that helped to shape the the various homes and buildings about Memoria. Unfortunately, their daughter was not only blessed with their skill in the arts, but cursed by her first dream being a nightmare, twisting her form into something less human and more beast. Optimism in her attaining normalcy waned as she grew older, becoming more fearsome in age, and anger in her twisted form caused her to lash out violently. It became unmanageable, and was subdued after another violent outburst. Faced with the choice of confinement and exile, she chose the latter and was sent out into the deepest wilds of a lower island, where she would remain for some years. It was at some time around three years later that she was recruited by the Harlequins, lured by their ideals of a reform, and returning larger and more powerful than before, inciting panic over her potentially seeking vengeance.